Spruces trees can be found all throughout the Maryland region. They are widely known for their vibrant color and ability to provide an incredible natural barrier. However, there has been an increase in fungal diseases among spruce trees. There are many reasons why this can take place, from needle casting, weather, and other environmental factors. 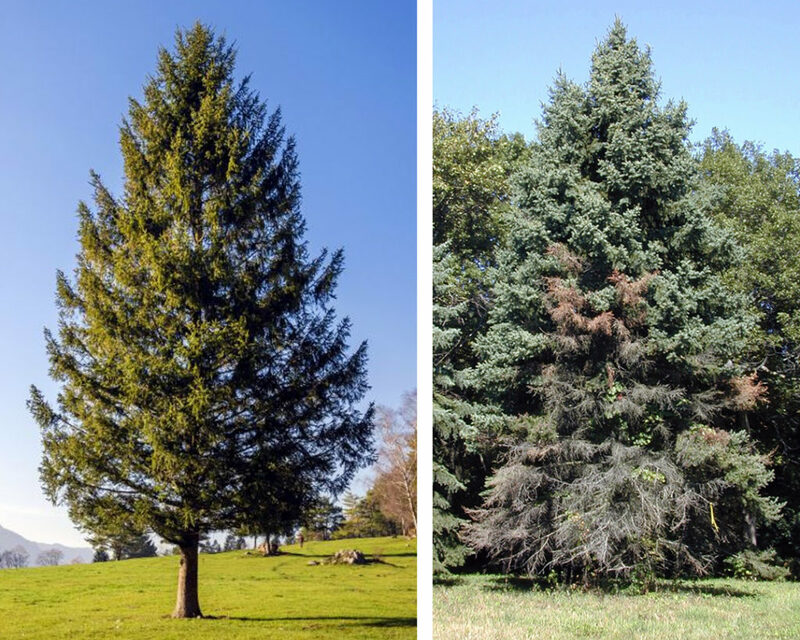 Suspect your spruce trees have a possible disease? Contact Rhine today for assistance with mitigating these issues. If caught early enough, some trees can thrive quite well. If a disease is too prominent, replacing them might be the most viable option. There are some fungicide treatments that can be used but a lot of the chemical-based remedies are only effective if caught early as noted. For spruce trees that may be suffering from cytospora canker disease, typically found with more mature spruce trees, we suggest to remove the dead branches as soon as possible. Disinfect your pruning shears, trim to the trunk, and clean up near the tree base. If the tree does need to be removed and you intend on planting another tree in its place, consider a different type to reduce the risk of future diseases inflicted upon spruce trees. Another concern with spruce trees is known as needle casting disease. This is typically seen on trees due to fluctuations in temperature, excess rain water, and other environmental factors. The pathogens can invade the tree needles through the stomata and often spread by wind and rainwater. Once the proper conditions are met, the infestation may begin. As the airflow is often more limited towards the lower parts of the trees, the lower and interior branches often get infected first, and symptoms may not show for upwards of an entire year. On blue and white spruce trees, the needles may turn a purple hue and then brown. If Rhizosphaera occurs, premature needle shedding can be prominent. Pycnidia, which are black fungi expunged by the spores, can also be notice. If your landscaping is more susceptible to such diseases, consider your options of tending to the tree or removing and replanting a new tree. If you want to replace with another spruce, Norway spruces are often more resilient. Keep in mind that there are many environmental factors that can affect your trees, from excessive heat, constant shade, water-logging, infestations of bugs or insects, and more. If you do see any beginning stages of root injury, declining of branch health or discoloration, or excessive or premature needle loss, remove these segments as best you can. There are many chemicals for aiding this, such as copper hydroxide, copper salts, azoxystrobin, and more. Fungicides should be applied in the spring season when new growth is about one-half inch long. Then, repeat the process again in the Fall, and intermittently as needed. With a full design staff and incredible landscape experts, we are able to provide a wide array of professional landscaping, construction, water management, and swimming pool services. To get started with your landscaping cleanup or swimming pool project, contact Rhine Landscaping by calling 410-442-2445 or click here today! This entry was posted on Tuesday, April 2nd, 2019	at 2:04 pm	and is filed under Benefits of Landscaping, Landscape Maintenance, Tree Planting, Trends in Landscaping	. You can follow any responses to this entry through the RSS 2.0	feed. Both comments and pings are currently closed.